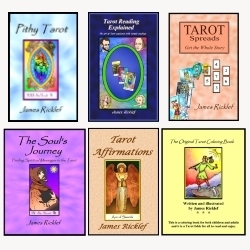 Of course, you will want to find correspondences that work for you and your own inner child. For example, for some people, the Page of Swords might say that their inner child wants to curl up with a good book. Although this discovery is one that I have only begun to explore, I think that seeing this aspect of these cards (the Fool and the Pages) is important. Certainly, we ignore the wants and needs of our inner child at our peril, for when s/he doesn’t get what s/he wants, watch out for a tantrum that can throw a monkey wrench into our future endeavors. Also, if any of these cards are in a problematic position (such as being reversed or in a “problem” spread position) they may indicate that we have a “wounded inner child” of some sort that we need to heal. As I explore this concept further, I may add more posts on this topic. But in the meantime, if you have any thoughts or experiences using this sort of correspondence, I’d love to hear them. I really enjoyed reading your Blog James!!! Not being very “smart” about Tarot (I’m still very much a “newbie”), your blog is easy to read & understand…it gets right to the point and I love that! Thanks David; I’d be interested to hear what comes up. Fabulous insight! I love your inner child interpretation, and so true! Ana and reikireadings — Thanks to both of you too.